Jericho was the main settlement of the goldfield on the Jordan River. 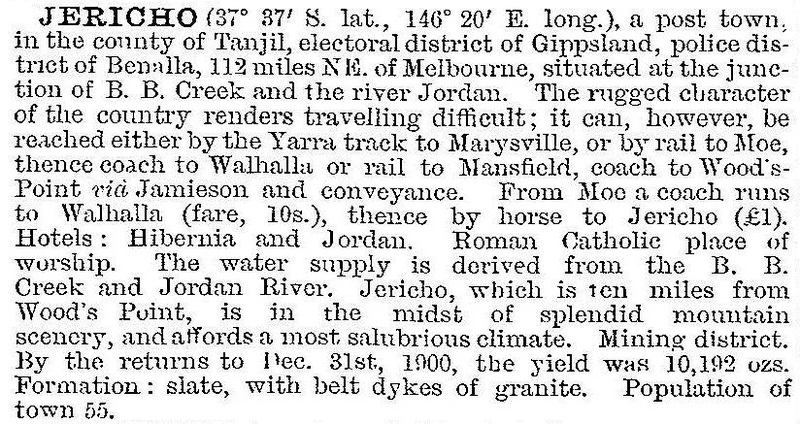 A tributary of the Thomson River, the Jordan rises high on the southern side of the Great Dividing Range, north-west of Walhalla. 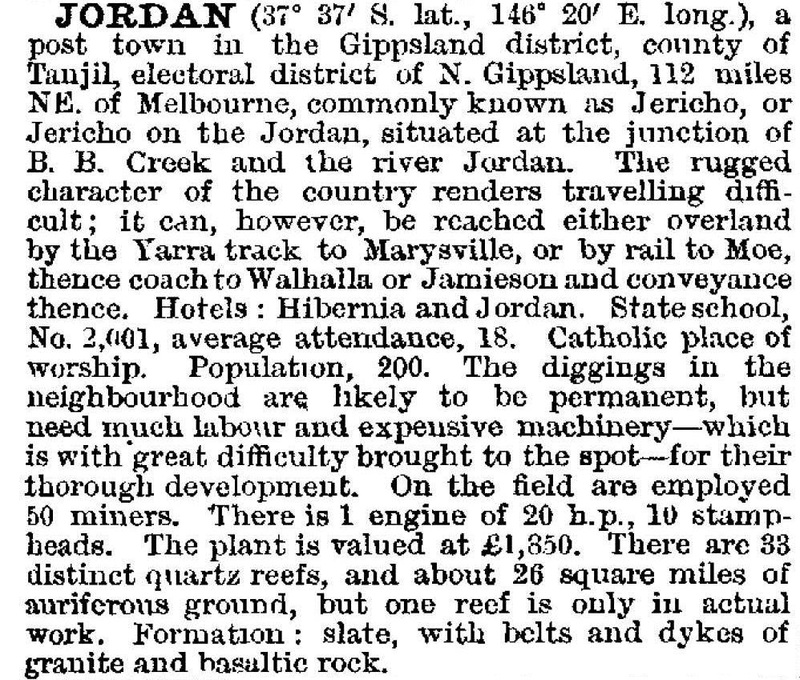 In 1861 prospectors descended into the steep and rugged Jordan valley from north of the divide. Biblical allusions explain the names, Jordan being ‘a hard road to travel’ and Jericho from the tree ferns which reminded diggers of palm trees in Bible illustrations. Alluvial miners rushed to the diggings, and by early 1862 the Mining Registrar reported 4000 prospectors on the field, working the river and creeks. At first, provisions and equipment were brought by pack horse over the mountains from the Jamieson area. After a reward was offered for a suitable route from Gippsland, several tracks were blazed. McEvoy’s Track, which became the most heavily used, entered the ranges near present Toongabbie and followed ridges to the vicinity of Jericho. The township of Jericho was established on flat land at the junction of the Jordan River and B.B. Creek, at the northern end of the field. Numerous tents and huts were soon served by stores and hotels, as well as a Catholic church built in 1864. A Catholic school operated until 1878 when a government school was established. Red Jacket, a small township further down the river, also had a government school from 1873. Smaller settlements on the field were Blue Jacket, Violet Town, Dry Creek, Victor’s Quartz and B.B. Creek. The Jericho school finally ceased in 1925 and the last hotel closed in 1935. In 1939 a bushfire destroyed the remaining buildings of the town. In the 1940s and early 1950s there was some sluicing for gold. Since then the area has been uninhabited. Some relics of gold mining and habitation remains, but the sites are overgrown and the area is rugged and isolated. Fossickers still prospect the valley but access is restricted as it is part of the catchment of the Thomson Reservoir.